I realize that the title of this post might sound a little dramatic. But I entirely, whole-heartedly believe that it’s true. Facebook is changing the world. First of all, the number of people who are joining is skyrocketing. According to CEO Mark Zuckerberg, Facebook now has 150 million active users. This means that if Facebook was a country, it would be the 8th most populated in the world. And this isn’t just a group of passive users; almost half of Facebook’s members use the service every day. On Christmas day, Facebook accounted for 1 in every 22 online visits. This participation is staggering. Tons of new people are signing up to use the site daily – and Facebook is a service that gets more fun to use as more people join, so it’s doubtful that this participation will slow. – Facebook is helping non-technical Web users begin to understand other Web services. I first noticed this because of Facebook’s “Status updates.” I have been promoting Twitter for about a year, but it wasn’t until Facebook’s Status Updates started getting popular that I was able to find a good way to describe Twitter to non-users. Now I just say “Twitter is like Facebook’s status updates, but that’s all it is, so you can update more frequently.” In another example, my cousin is organizing his 15th high school reunion using Facebook, and he wanted his event to be picked up by Google. This allowed me to give him a quick rundown on SEO and how search engines work. There are also reports that Facebook is gearing up to launch a “like” feature that will replicate a popular FriendFeed functionality. This not only will be incredibly popular with Facebook’s members, but will allow them a better understanding of FriendFeed. Facebook’s popularity and excellent user interface is helping to make Web use more mainstream and less frightening to Internet novices. This alone is a major game-changer. – Facebook is changing professional networks. I am currently looking to hire a part-time, contract Web developer to help out with my business. I am actively looking through my Facebook contacts to see if anyone in my network is a developer and might be interested in the job. I can recruit through Craigslist and Boston.com (and will likely pursue those routes, too); but if I can find someone I know – even if it’s someone who I haven’t worked with, seen or talked to in years – I am pre-disposed to hiring that person. Of course the decision will ultimately come down to experience and qualifications, but a network is very important in finding a job, and Facebook is suddenly adding people to my network who I haven’t spoken to in a decade. – Facebook is bringing friends closer. In the spectrum of being able to keep up with friends and staying in touch with people, I am pretty good. I would say slightly above average. Even so, I only have about 3 people who I talk to every day (my husband, my bf/co-worker, my business partner). Then there are about 6 other people who I talk to multiple times a week (my brother & sister-in-law, my neighbors who live downstairs and a few local friends). As my circle gets wider, the frequency of communication drops. Facebook is changing this, by facilitating daily communication with a much wider circle of friends. These are friends who I love dearly, but who just don’t live close to me and neither of us have the time to call and check in every day. But we can read each other’s status updates, look at the photos that we’ve posted and have at least an idea of what is going on in each other’s lives on a daily basis. – Facebook is connecting & creating communities. It would be pretty interesting to see the connections between friends in Facebook charted out, but it seems that most of the connections would be concentrated locally or with specific groups – work friends, high school and college friends, church buddies, soccer teammates, etc. But the really powerful thing is that each person’s connections make up a community of people who share at least one thing (or person) in common. If you expanded out even just one level of separation and looked at all of the connections of my connections, there would be a substantial community of people who likely share at least some commonalities. And when communities of people hook up and unite, it’s amazing what they accomplish. – It’s becoming a verb. Chris’ new favorite expression is “I’m Facebooking.” The last major service that went from noun to verb was Google. Perhaps that is enough said. I spent the weekend in my hometown with my family. It was a great weekend filled with events. Not surprisingly, the hot topic of conversation was my cousin’s newborn triplets. Blog. My family now uses the word “blog” in everyday conversation. I have a very smart family, but not one that is at the bleeding-edge of technology adoption. But they now use the word blog (and know how to scroll through a Web page on the iPhone). I have one other cousin with a blog. 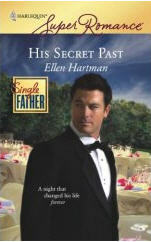 Hers is about writing romance novels. (By the way, her latest book was just released, please go buy it, read it and somehow give me the credit. This weekend she was signing autographs and happened to mention that I wasn’t her favorite cousin and I’m on a campaign to correct that terrible error.) At the family’s Memorial Day picnic, a conversation about “stripper names” broke out because of this post on her blog. Blogs are beginning to become more mainstream. This will happen more and more quickly as people’s sisters, friends and fathers start blogging, and as more and more people see the benefits of being able to stay connected to each other – and involved in the conversation – by reading what each other writes. There was an article in Business Week last week titled “Beyond Blogs,” about the social media phenomenon and how it no longer involves just blogs. I have written in the past that Twitter might be too difficult to use to get mainstream adoption. But after this weekend, I think that I’m changing my mind. My family might not know what RSS is yet, but they know what blogs are. And many of them were talking about how they visited the triplet’s site multiple times per day to find out what was new – they are only a small step away from finding out about the joys of RSS. From there, it’s not too far to Twitter and FriendFeed. Granted, the services will have to exist for many more years for widespread adoption to happen, but if the services make it that long, I predict that the masses will catch on. Because my family is interested and informed, they will follow the conversation, wherever it takes them. Which brings up another point about conversations – they aren’t just happening online. Conversations are happening on blogs, on Twitter, on FriendFeed, as well as in bars, at grocery stores and on walks through the woods. People who try to own or control the conversation, whether by requiring a complicated registration processes or demanding that the conversation happens when and where they want it to, are going to fail. My first experience with FriendFeed was similar to my first experience with Twitter – the site was a little difficult to get into it, kind of hard to see the value. But like with Twitter, once I started “friending” people, extending my network, and working the site into my daily routine, FriendFeed started becoming more useful. Turns out that Steve Rubel, author of the popular Micro Persuasion blog, shared one of my stories in Google Reader – specifically, Why I’m Kissing Tumblr a Sad, Sad Good-bye. That story ended up on FriendFeed (along with all the other articles that Rubel shares). Rubel is a popular guy on the Web, has a lot of followers. So the post got a much wider distribution than it would otherwise have gotten. And the comments on FriendFeed were outstanding and lively. You can read the stream here. That sparked many other articles about the topic here, here, here and here. And that discussion, in turn, caused the folks at Tumblr to make some changes. That is powerful. And fun! The conversations that are happening in FriendFeed are often interesting, many of the current thought-leaders about things related to the Internet and Web 2.0 hang out there, and if companies are listening and taking action because of the dialog – well, that’s incredibly exciting. Friend me at FriendFeed here: http://friendfeed.com/16thletter. And I would love to know your impressions of using the service – or if you have similar stories of a company “hearing you” and taking some action. It appears that the way I set things up, my blog is updating my Tumblr is updating my Twitter. 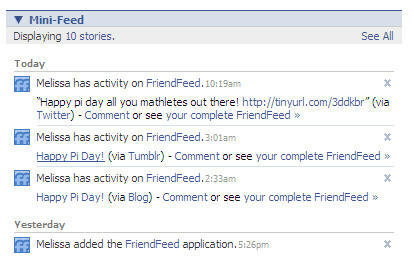 And all are updating FriendFeed, which is updating Facebook…this could get ugly. Couldn’t it? And I am not even using all of the social networks. But I imagine that the same thing would happen if I update Flickr – or any other service that I use that feeds to multiple sites. How do I manage all the feeds that are feeding and cross-feeding everywhere? I don’t think that this is really a FriendFeed problem, per se, it just brought the issue to light for me.